Lucille McCall English, 68, of the Persimmon Community, passed away Sunday, August 26, 2018 at her home. She was the wife of, Edward Kay Vernon English, Sr.
Born December 14, 1949, she was the daughter of the late Turner McCall and Mattie Perry McCall. 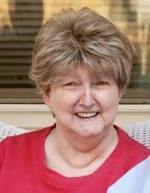 She worked at the Bank of Clayton and also at Rabun County Bank and was of the Baptist faith. In addition to her parents, Turner and Mattie McCall, she was preceded in death by, a son, Edward Kay Vernon English, Jr.and a sister, Bonnie Blackwell. She is survived by her husband, Edward Kay Vernon English, Sr., of the home two daughters, Katrina English Morrison (Greg) of Simpsonville, SC and Tabitha English Griggs (Paul) of Mountain City, GA, and by eight grandchildren, Scottie Griggs, David Griggs (Katie), Eden Griggs, Felecia Anderson (Randy), Michael Giambrone, Joshua Morrison, and Ashley Morrison.Kaye Nicole English , Seventeen great grandchildren and five sisters, Helen Winkler, Virginia Wilburn, Linda Roach, Alice "Bo" Cobb, and Jewel Murray. Also survive.